Hands up who has Ella Woodward’s book Deliciously Ella? I do, and this past weekend have cooked up a storm! I am immediately drawn to the sweet recipes in the book and as soon as I saw this raw berry cheesecake (that has absolutely no cheese incidentally) I just knew it would be something I would make again and again. 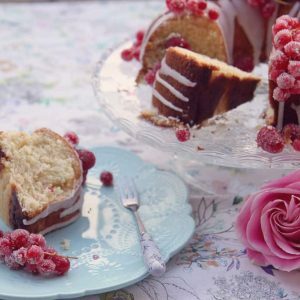 This recipe is also suitable for vegans and is gluten-free. For my version, I added a few frozen blackberries as had them lolling about in the freezer and instead of making one big cake I made four mini cheesecakes. 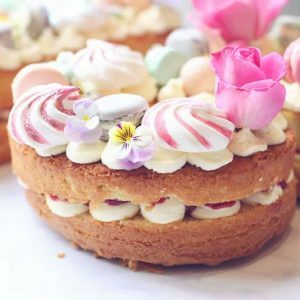 I decorated the cakes with the most beautiful edible flowers from Maddocks Farm Organics which were probably the most exciting thing I bought last week! I can’t tell you how delighted I was when they arrived, these gorgeous little flowers really do provide endless possibilities for decorating cakes and making flower ice cubes-more on those to come in another post. Before you make your cake/s be sure to slice the bananas and pop them in the freezer along with the blueberries until frozen, if you use pre-frozen ones they will be too watery. Place the almonds in a food processor and blend until broken up into tiny pieces, they should still have some texture to them. Add the pitted dates to the almond mix and blend until a sticky mix forms. Press this into a loose-bottomed cake tin or if making minis as I did, press into stainless steel chef rings on a large plate and put into the freezer. Make the middle layer by blending all of the ingredients until smooth and creamy. I used my Nutribullet for this and it blitzed through it all with ease-such a handy kitchen tool to have for tasks like these, it really is very powerful. Take the base layer out of the freezer and pour over the blended ingredients. Reserving about a quarter to use for the next layer. Once the bottom and middle layer have been in the freezer for around 20 mins commence making the final layer. Add remaining ingredients to the blended mix you reserved earlier and blend again until smooth and creamy. Pour over the middle layer and pop back in the freezer for 2-3 hours. This cheesecake is simply divine, and is definitely a wonderful sweet treat even though there are no naughty ingredients at all! If you try it I hope you enjoy it as much as we did. 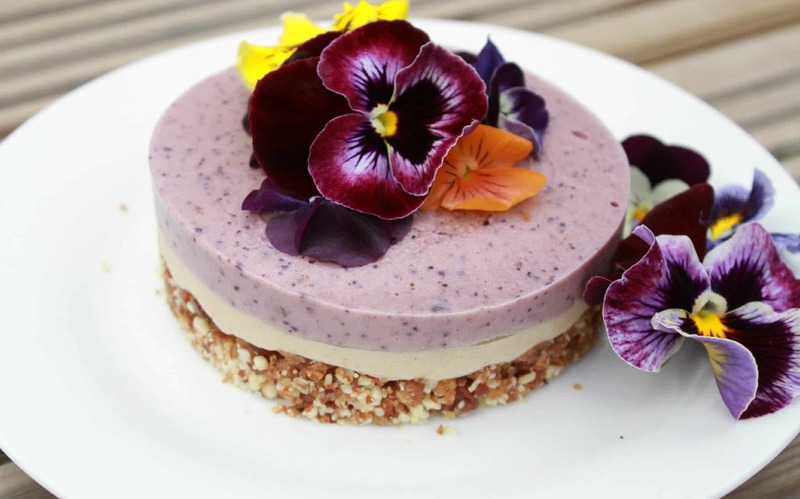 This raw berry cheesecake is quick and easy to make, suitable for vegans and is gluten-free. Press this into a loose bottomed cake tin or if making minis as I did, press into stainless steel chef rings on a large plate and put into the freezer. Pin the image below to your recipe board.. 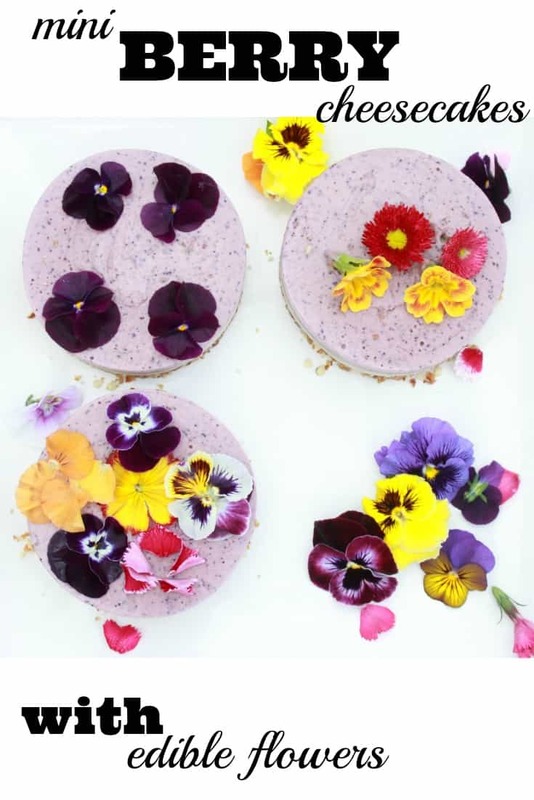 If you would like to check out the original recipe for this beautiful raw berry cheesecake or indeed the loveliness that is Deliciously Ella’s blog you can do so here. Gosh Amy! These look so bloody amazing! 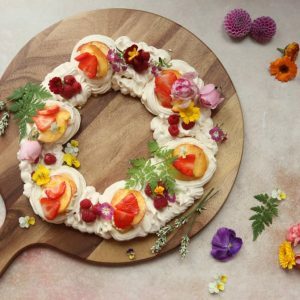 Ridiculously pretty – (almost) too pretty to eat in fact. 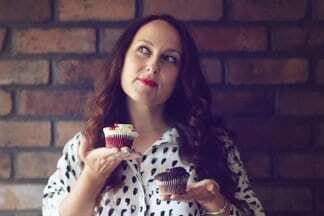 I love the cookbook – have only made one recipe from it so far (choc chia cookies) but can’t wait to try more. I’m especially liking the sound of this one after the way they turned out! Stunning pictures and the mini cheesecakes look so pretty. 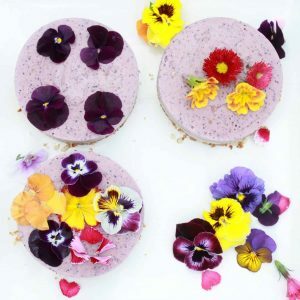 I love edible flowers – they can practically make any dish look beautiful. I can’t imagine a cheesecake without cheese but these do look creamy and divine so will have to try them out. 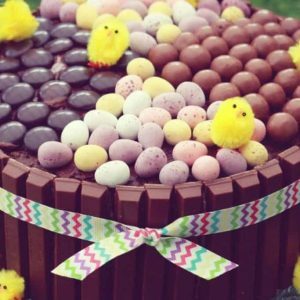 Oh my…I nearly licked my computer screen, these are divine!! Definitely one to try for the summer!! 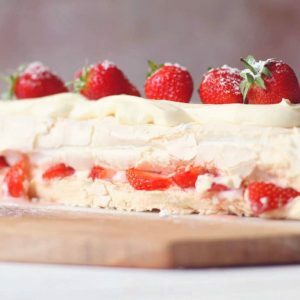 Berries are in season so it’s fun to use them while baking. They not only make a great garnish, they’re also great inside the cheesecake! The fact that this treat is considered “raw” is an extra bonus for health lovers. Oh wow these look delicious! I wouldn’t want to eat them because they are just too pretty! I think I need to go buy edible flowers.